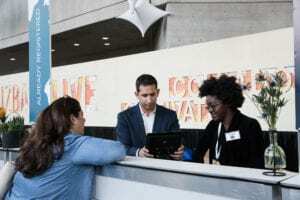 Epic Staffing Agency joined more than 2,000 of the most influential event and meeting professionals who gathered in New York for BizBash Live at the Jacob K. Javits Center in October 2018. Epic Staffing Agency with its offices inside Rockefeller Plaza, has been building its client list in the New York metropolitan area since it opened its second office outside of Miami inside Rockefeller Plaza in midtown Manhattan. “The expansion of our services in New York has made us a formidable presence in a very competitive marketplace, and that showed from the great interest in the amount of inquiries we had at the Javits Center,” says Andre Lira, president of Epic Staffing Agency. For BizBash Live: Florida, Epic has been selected as the partner agency to handle attendee registration and managing convention floor hospitality for four consecutive years at the expo.